Two rising stars return home to help guide younger students who aspire to be first in their family to attend college. Luisanna Villa (rising Senior, Fordham University) and Imani Ford (rising Senior, Lafayette College), are both solidly on the road to success. But the path has not been easy. Both were highly motivated, hard working high school students when their paths crossed as they took part in the Let’s Get Ready college coaching and SAT tutoring program five years ago. Let’s Get Ready uses college students to coach underserved high school students for nine weeks over the summer, guiding them through the college admission process. 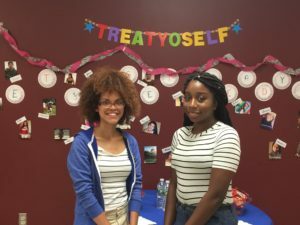 Thanks to Let’s Get Ready, Luisanna and Imani were exposed to many options they would never have considered, and each landed a spot at their dream school. Luisanna and Imani are terrific role models for the younger students, who are the beneficiaries of the knowledge, experience, and real world advice that the older students can offer. Kids’ Club is proud to support Let’s Get Ready, one of the cornerstone college prep programs we fund so that every student at Sleepy Hollow High School has an opportunity to succeed in college and beyond.